Bellcrest Wicca Stolen Fortune, call name 'Tinker'. Photo on the left taken at 8 weeks. This pretty girl is now living in PA. with Cheryl Hathaway, Wicca Boxers. She is to be shown in obedience by her owner, Cheryl. Hopefully she will be good at it, time will tell. Cheryl tells me she is pretty smart. Photo on the right taken at 8 months of age. 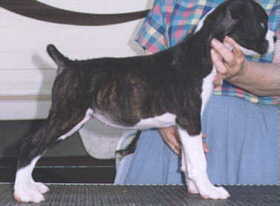 We will add more pictures as Tinker grows up. Maybe we can get some action shots of her in obedience right. 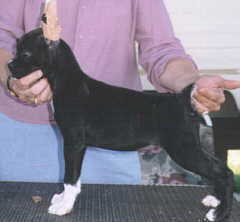 See Tinker as an adult on the Wicca Boxers website. Interesting footnote about 'Tinker'.....she now has been bred 3 times and in each litter she has had puppies born with the same bob tail that she was born with. In litter #1 there was 1 puppy with a short tail and in litter #2 there were 4 puppies with short tails. On the left - This is Bellcrest Fortune Waits Echo, call name 'Lily'. Photo taken at 8 weeks. This sweetie is now living in Michigan with her new owners, Terry & Vicki Agle. 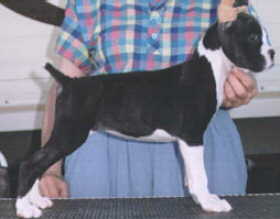 Hopefully she will conintue to look as promising as she does in this photo and will be shown in conformation. We are waiting for new photos of Lily. Terry & Vicki promised to send some recent pictures. All reports back from those who have seen her are promising. On the right - Bellcrest Worth a Fortune, call name 'Brooke' Brooke remained here at Bellcrest until she was 5 months of age. She then went to live with the Bucar family in Windsor, Ont. Her call name is now 'Cozmo'. We look forward to receiving some photos of her so we can put them up here. The two flashy girls beating up on my Grandaughter Jennifer Ross. 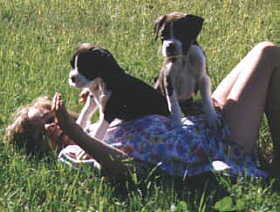 Jen and puppies are both enjoying themselves. There is nothing like kids and boxer babies!